It is with great sadness we had to say good-bye to our sister Jean. Jean passed away peacefully at Holy Family Home from Lymphoma. Jean was the most generous, compassionate & caring sister any one could have. When our father passed away in 1950 leaving behind our mom to care for 8 children, the 2 oldest, 16 year old Paul & 15 year old Jean took over the farm responsibilities. Jean also helped with the younger siblings becoming like a second mom to us. Her caring ways did not end even when we got older. She was there for all of us. Jean was determined & took chances, taking over a restaurant/bus depot in Gilbert Plains MB & made it a success. After moving to Winnipeg, Jean worked at Canada Post & took an early retirement to look after our ailing mother. She enjoyed travelling, taking our mom to Ukraine to see relatives, as well as making numerous trips with her sisters Lil & Irene & mom to California, specifically to be on the Price is Right. 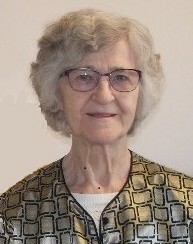 She was a member of St. Andrews Ukrainian Catholic church; in 2001 she served as President of UCWL. Jean was predeceased by dad John in 1950, mom Nadia in 1996, brother Paul in 2001 & sister Lil in 2014. She is survived by sisters Irene (Roy), Phyllis, Elsie, brothers Ed & Marko and numerous nieces & nephews. Prayers will be held September 6, 7:30 P.M. at Korban Funeral Chapel. Funeral services will be held September 7 at 10 A.M. at St. Andrews Ukrainian Catholic Church, 160 Euclid Ave, with Father Len Ratushniak CSsR officiating. Interment at Holy Family Cemetery. Pallbearers will be Jean’s nephews, John, Rob, Greg Motkaluk, Cory Hoes, brother Ed & brother-in-law Roy. Don’t forget your loved ones while they’re still with you. In lieu of flowers please make a donation to Holy Family Home or Cancercare MB.